While the crisp air and snow-covered streets can paint a pleasant wintry picture, cold weather can also bring a number of serious health hazards, including hypothermia and frostbite. This winter has been particularly harsh in South Korea, with its average December temperature notably lower than the seasonal average. A total of 137 people were reported to have suffered from either hypothermia or frostbite from Dec. 1 to 18. Among them, 21.6 percent were placed in intensive care, while 15.5 percent were hospitalized. Five people died. The number of reported patients is much higher than last year’s 67. Hypothermia ― abnormally low body temperature ― often results from prolonged exposure to cold that eventually uses up a body’s stored energy. Low body temperature ― 35 degrees Celsius or less ― affects the brain and it makes the person unable to think clearly and move well. The condition can be fatal if it is not detected promptly and treated properly. Common symptoms include shivering, slurred speech, confusion and poor decision-making, as well as drowsiness. When the condition worsens, shivering often stops. Because one cannot think clearly when one’s body temperature drops, it is possible for the person to be unaware of the illness and fail to do anything about it. Those who have hypothermia must seek medical attention immediately. 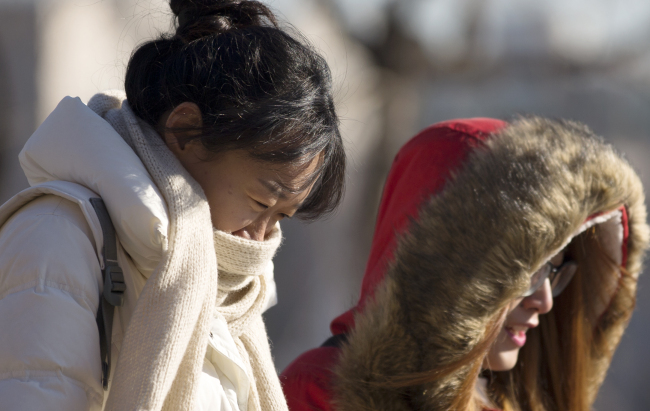 In order to prevent hypothermia, the Health Ministry advises that people wear warm, multilayered clothing as well as a warm hat, gloves and scarves. The ministry also recommends wearing longer socks and boots. “Make sure you don’t drink alcoholic beverages because it can worsen your condition significantly,” the ministry said. More than 80 percent of the hypothermia patients reported this month were male, and 52.6 percent had chronic diseases, such as diabetes, heart diseases and high blood pressure. Also, 45.7 percent were drunk when they got hypothermia, according to the Health Ministry. Notably, 60 percent of those who died of hypothermia were suffering financially and had been drinking when they developed the condition, the ministry said. “The elderly who live alone, the homeless, and those who have chronic diseases are especially vulnerable to cold-weather health hazards,” the ministry said in a statement. Meanwhile, frostbite occurs when skin and underlying tissues freeze. Symptoms include redness of the affected area, swelling, pain and numbness. The condition is most common on the nose, fingers and cheeks. Staying out in the cold and wind too long can very often lead to the condition, as well as wearing clothing that isn’t suitable for cold, wet or windy weather. In severe cases, surgery or amputation may be necessary to remove the decaying or dead tissue. As wet clothes increase the chance of heat loss, the ministry said it is important to wear warm, dry clothing when spending a lot of time outdoors in the wintertime. The ministry said it is important to get into a warm place as soon as possible when one notices signs of frostbite. Immersing the affected skin in warm water can help, but staying near a stove, a fireplace or a radiator must be avoided as numb, frostbite-affected areas can be burned easily.